Are you tired of using a slow printer? Do you want one that can produce quality prints but works faster too? If you do, then you will be happy to know that the exact thing that you are looking for has just been introduced to the market, initially in Korea. The premier company, LG, had presented their latest product in the gadget category. 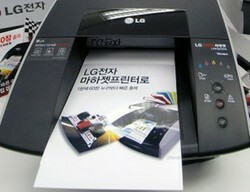 They called it, the LG Machjet LPP6010Nfastest printer in the world. The impressive machine is said to print at least 60 pages in a minute, a well-partnered tool for your office ergonomics equipment. With this, the company had succeeded in introducing a ground-breaking product that will truly please millions of users around the world. Even more remarkable, is the fact that the speed is obtainable with just 32 watts of power. This means, it is a power saving machine that is environmentally-friendly. Also, the printer’s Hyper Small Drop Technology makes it possible for the printer to use up just a smaller amount of ink when printing. Thus, the amount of ink used is reduced. Of course, you can also save money for this. Furthermore, unlike the common desktop printers, the LG Machjet LPP6010N fastest printer makes use of the latest innovative printer technology so as to produce high quality prints at super fast pace. The LG Company had made this happen with the help of the high-density large print head hardware that allows the machine to yield prints at a speed two times faster than the current best-selling inkjet printers. 1600 x 800 dpi resolution at 60 pages/ minute. ++ The Machjet LPP6010N features a Memjet® Page-Straight Array Printhead with 70,400 nozzles that releases more than 700 million drops of ink per second at speeds up to 60 pages per second, making it the fastest desktop A4 color printer in the world. An awesome breakthrough in arena of printers, that can shake up their competitors. With all of these features, it is understandable why LG Machjet LPP6010N fastest printer is one of the must-have gadget in your office. Check out the video below uploaded by UBERGIZMO to see how fast the printer works.